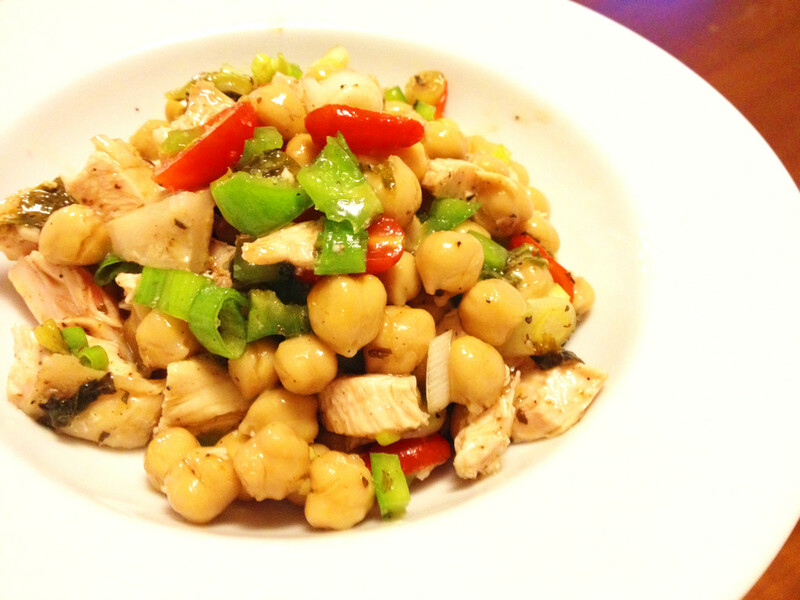 Chicken and Chickpeas Salad – See. Food. Write. A really quick summer salad can be made from two basic ingredients: a can of chickpeas (garbanzo beans) and leftover roast chicken. I happened to have both, and whipped up this very simple yet refreshing and filling meal in about 15 minutes. It also allowed me to use up some pear tomatoes that were starting to dry out, and a bell pepper that was starting to mold on one end. 1 large chicken breast, already cooked, and refrigerated for at least several hours. Roasted meat provides better flavoring, while steamed or boiled meats will taste leaner. Thigh and leg meat work equally well. 1 15 oz. (425g) can of cooked chickpeas. 2 spring onions (scallions). Can also substitute with a very small white onion or red onion. You can leave this ingredient out if you don’t eat raw onions. 1 handful of pear or cherry tomatoes, or 1 medium-sized Roma (plum) tomato. 1 half of a green bell pepper. Yellow or orange bell peppers can also be used. Open the can of chickpeas, and drain nearly all of the water. Pour the peas and the remaining water into a mixing bowl or a large food storage container. De-bone and dice chicken into cubes roughly the size of your chickpeas. Add chicken to your mixing container. Chop the pear or cherry tomatoes in half, or if using a Roma or some other whole tomato, dice into cubes roughly the size of your chickpeas. Do the same for your bell pepper. Add the diced tomatoes and bell peppers into your mixing container. Coarsely chop the onions, into pieces no bigger than half the size of your chickpeas (see photo for reference). Add onions to your mixing container. Add about 1/4 cup (60 ml) of balsamic vinaigrette dressing into the container. Then sprinkle in some ground black pepper and some salt. Use a large spoon to thoroughly mix the ingredients together so that the dressing is evenly mixed with your ingredients. Take a tasting bite, and add more dressing, salt, or black pepper according to your preferred taste. Chill the mixture in the refrigerator for about 5 minutes. This lets the olive oil in the dressing congeal a bit, and helps bind the salad together. Remove and serve in a chilled bowl or plate. The salad should take about 15 to 20 minutes to make, but may take longer if you are still getting comfortable with your knife skills, given the chopping required. This salad should serve about 2 people, or 1 very hungry person (me, in this case). You can make the dish more filling by adding cubes of stale bread into the mix, or serving a fresh, warm hunk of bread on the side. Eat immediately; refrigerate any leftovers, but eat by the next day. Pair with a glass of rosé wine or sparkling water, if you’re thirsty! Chicken and chickpea salad. Photo © Ben Young Landis. Great photo! Looking forward to trying this one out. If planning ahead, would it be better to chill the mixture for a longer time period than 5 min? Thanks, Patrick! As for the 5 minutes, that’s just to chill down the salad a bit, if the ingredients warmed up during preparation. Otherwise, if you’re making this ahead, you can just throw it in the refrigerator for however many hours until you’re ready to eat! This looks delicious. Ima try it. Let me know how you like it, Carrie Anne! Super easy if you already have an already-cooked supermarket chicken.